You may have heard of all the young backpackers coming to Antigua to climb one (or more) of the impressive volcanoes that surround the town. But if you don’t see yourself doing that, what are the other things to do in Antigua Guatemala? There are plenty as it turns out! Besides consistently ranking as travellers’ favourite town in Central America, and being a mecca for affordable Spanish classes, Antigua has a unique particularity: a plethora of ruined churches, convents, and monasteries, leftover from the disastrous earthquake of 1773. And the best part is: they’re not crowded at all! The activities listed below won’t break the bank and don’t require you to possess a high level of fitness either. 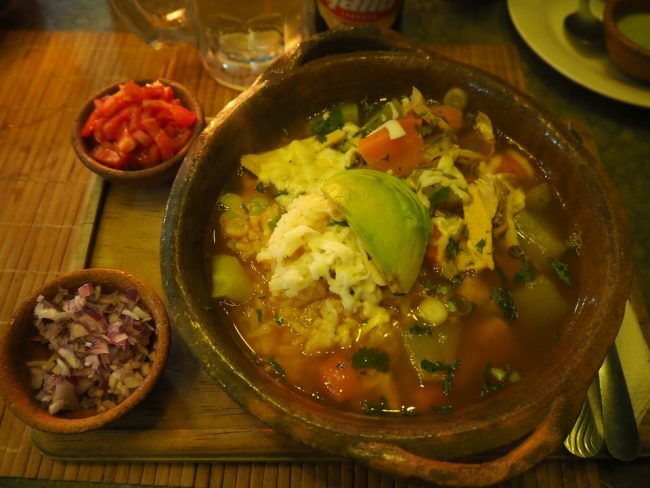 After reading the best things to do in Antigua Guatemala, check out my restaurant suggestions and some important tips at the bottom of this post. Note: All prices in this post are in Quetzales. At the time of writing, US$1 = Q7.7 and CA$1 = Q5.7. Check xe.com for current rates. 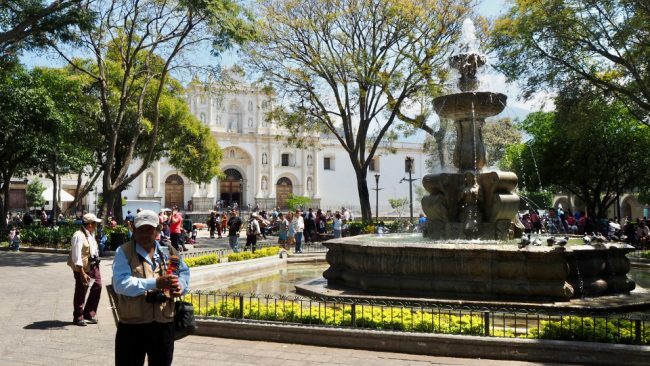 Located in the centre of the old town of Antigua, the Parque Central is a pleasant green park anchored by a fountain, and always full of locals, tourists, and ladies selling handicrafts. It becomes especially animated during weekends, buzzing with local families and toy sellers. On the eastern side of the park you will find the blindingly white Catedral de San José, and on the northern side the Ayutamiento (City Hall). Climb up to the second floor of City Hall for good views over the park. If you’re looking for a more peaceful green space, the park next to the water tank (Tanque La Unión) may fit the bill. It’s also across the street from a nice church called Iglesia San Pedro Apóstol, which is lit prettily at night. Completely hidden from the street, Santo Domingo is a sprawling complex adjacent to the Casa Santo Domingo luxury hotel. 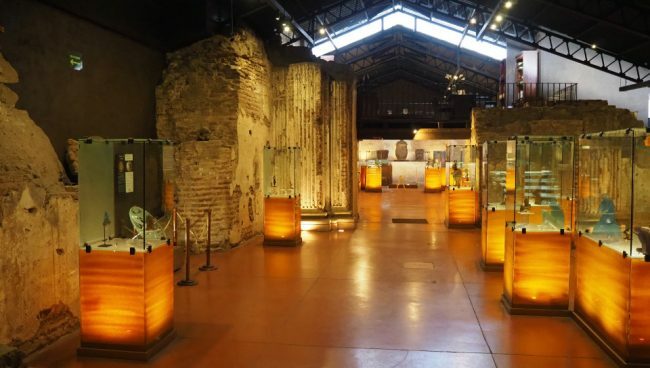 It includes several small museums and art galleries, event spaces, a convention centre, a garden, El Refectorio (one of Antigua’s top restaurants), and even chocolate and candle shops! The Museum Promenade includes the Colonial Museum, Archeology Museum, Museum of Pre-Columbian Art and Modern Glass (a rather unusual combination and my favourite), Marco Augusto Quiroa Hall and Hall of the Artist (for temporary art exhibits), Sacatepéquez Arts and Popular Handicrafts Museum, and Pharmacy Museum. You can visit all of those places on a single ticket which costs only Q40 if you enter through the 1A Avenida Norte door, rather than the hotel. It’s easy to spend several hours here, and it’s surprisingly quiet. 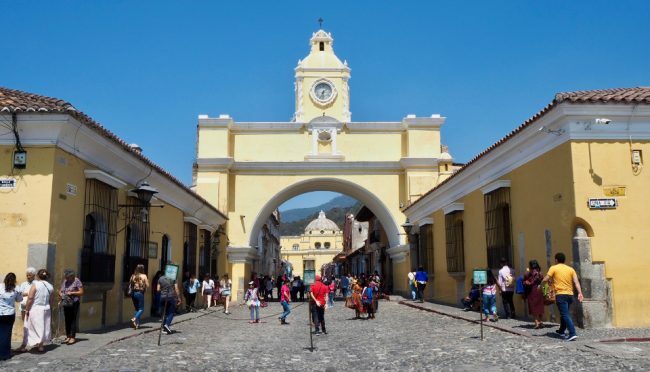 The iconic image of Antigua Guatemala is the Arco de Santa Catalina, a custard-yellow arch topped with a clock tower. It is probably the most photographed structure in Antigua, although if you want a photo without throngs of people, you’ll need to get up very early (or maybe come after a rainstorm)! In one direction, the arch perfectly lines up with volcano de Agua which towers over it. In the other, it frames the side wall of the Iglesia de la Merced in matching tones of yellow. 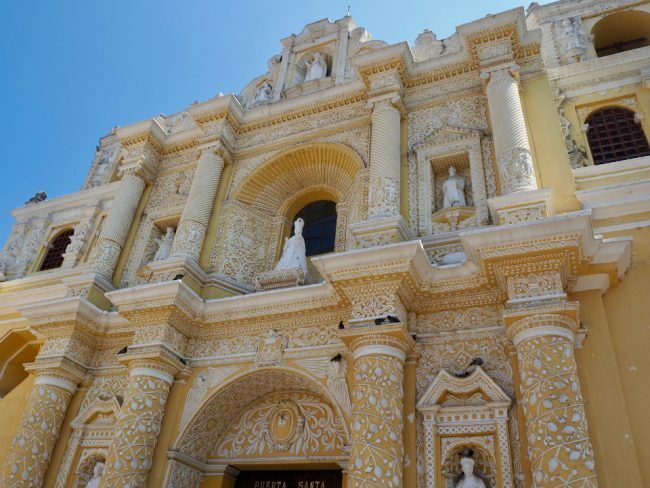 La Merced is actually a very elegant Baroque church, especially when viewed from the front. The intricate curly white decorations on its facade make it look like a wedding cake. A closer look reveals stucco reliefs of corn, flowers, and plant-like arabesque patterns, along with statues of Mercedarian saints. You will see people selling handicrafts everywhere in Antigua: in the Parque Central, near La Merced church, walking down the street, even sometimes while you’re trying to enjoy a quiet meal “inside” a restaurant. The textiles in particular are beautiful, but not everyone likes to be bothered by street sellers and have to negotiate a price while wondering about the quality of what they’re buying. If that’s you, head straight to the Nim Pot handicraft market, 50 metres or so north of the Santa Catalina Arch. 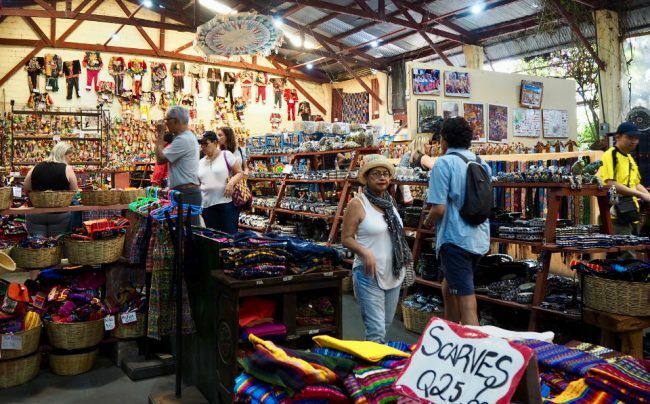 This large hangar-like permanent market houses shelves after shelves of Guatemalan handicrafts such as textiles (huipiles, scarves, table runners, placemats, etc. ), ceramics, masks, and more. The best part? All the prices are fixed and nobody will bother you. You can browse to your heart’s content and then take all your purchases to the counter where they accept credit cards (as long as you can show some ID). For DIY sewing projects, you’ll find various pieces of used fabric for cheap on the left hand side as you enter the market. 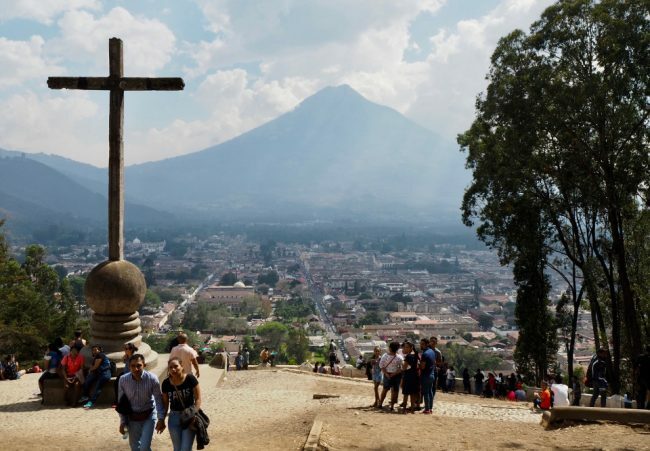 If you’re not up for climbing a volcano but would still like some exercise rewarded with a view, head up 1a Avenida Norte to Cerro de la Cruz, a viewpoint with a cross which overlooks the town and volcano de Agua. Walk up the gradually sloping avenue and take the staircase to the left. Yes, it’s a lot of steps, but it’s definitely feasible if you’re at least minimally fit and you take your time. You can also get there by taxi or tuk-tuk. Go earlier in the day for best views of the volcano as the air seems to grow hazier as the day progresses. Also try to go when lots of other people are going (like midday on a weekend) for safety reasons, as the staircase climbs through a forested area. Security is sometimes posted halfway up the stairs. At the top you’ll find a belvedere, a few benches, a big cement cross, and of course handicraft sellers (although they’re not pushy here). 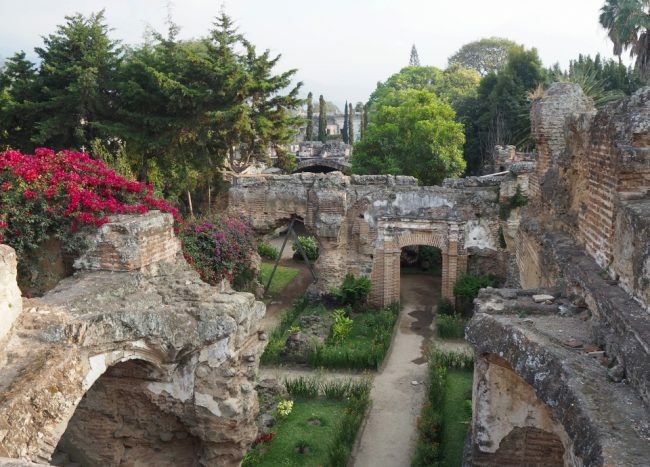 These atmospheric ruins are located behind the church of San Francisco El Grande. Costing only Q8, they include a small museums about the miracles attributed to Brother Pedro, a 17th century beatified monk buried here. These ruins are fun to explore, with many courtyards, nooks and crannies, surrounded by greenery and brightly coloured bougainvillaea. Don’t forget to climb up the stairs for a nice view over the ruins and beyond. I went in the late afternoon just before closing. The light was soft (good for photos) and there were few people there. These are probably the cheapest ruins in town. If you want to escape the urban noise and fumes without having to pay for an expensive day trip, walk 20 minutes south of the Parque Central on 5a Avenida Sur to Caoba Farms. Buildings become more and more sparse, until the cobblestones stop and you cross a small river. 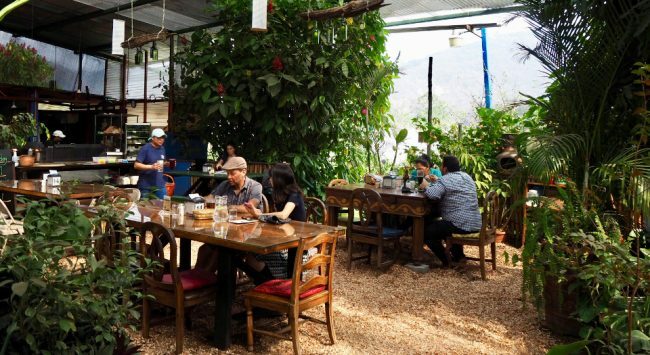 Once at the farm you can enjoy a delicious lunch at their restaurant. Everything used in their meals comes from the farm, so it does’t get fresher than this. I had a big pulled pork sandwich with potatoes and a side salad. It’s not exactly cheap, but the servings are huge, the air is clean, and it’s quiet. Even the wood chips that cover the ground smell good! Afterwards, take a stroll around the well-maintained vegetable gardens, and past a few cages housing goats, ducks, and chickens. There is even a small butterfly conservatory, which closes at 4:00 PM. 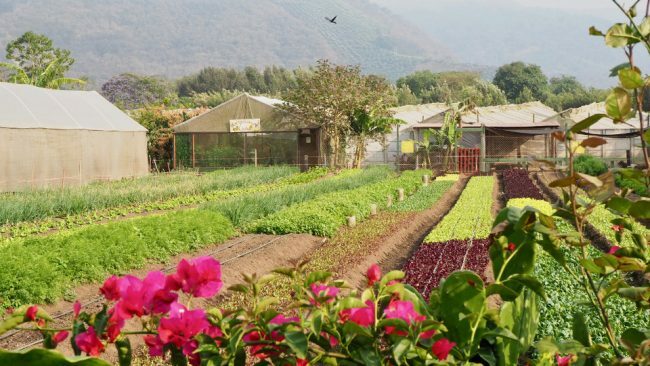 You can take one of several tours with a bilingual guide to learn more about organic and sustainable agriculture. See tour schedule and prices here. A couple of special events also take place each week. Saturday is Farmer Market’s day, featuring artisanal products for sale, live music, and free activities. Caoba Nights takes over every Thursday evening with dinner specials, board games, and more live music. Both events provide free shuttles from/to the town centre. 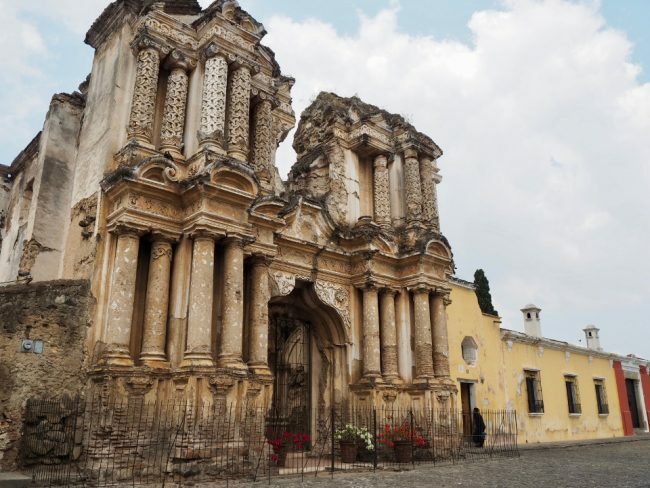 Studying Spanish is one of the top things to do in Antigua Guatemala. A lot of people come here to attend Spanish language programs at one of the many schools. If you’re here for a week or more, but don’t want to study in a group class, you can take one-on-one private lessons with an instructor either through a school, or with an independent teacher. I’ve always found that private lessons were the best and quickest way to learn Spanish, especially if you’re not a complete beginner. Private teachers will likely advertise via notice boards in hostels, cafes, and bookstores. Or you can just find them at various schools. They should be able to customize lessons to your needs. 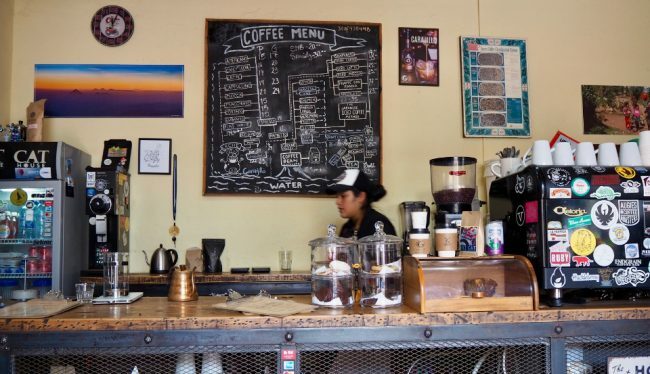 Guatemala is a coffee-producing country, so it shouldn’t come as a surprise that drinking coffee is one of the best things to do in Antigua Guatemala. The old town is full of small local coffee shops. I enjoyed a great cappuccino every morning while I was here. The trendy place to go these days is Fat Cat Coffee House, a block and a half east of Parque Central on 4a Calle Oriente. Not only do they roast their own beans, but they also offer coffee machine repair and a barista school. As you would expect, their coffee is delicious, but the price is a little high (Q19 for a small cappuccino) and the place is busy. An alternative that quickly became my favourite coffee shop is Guate Java at the corner of 7a Avenida Sur and 6a Calle Poniente. 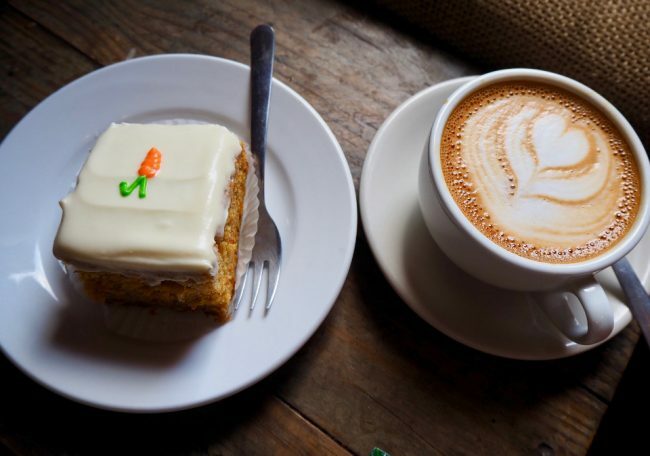 Being near the edge of the Old Town, it’s quieter than Fat Cat, cheaper (Q15 for a small cappuccino), and their cinnamon rolls and carrot cake are both so yummy. They also roast their own beans so the coffee is quite delicious here too. There are tons of tourist-friendly restaurants in Antigua and they all pretty much seem to serve slow food. At least, service is slower than what you’re probably used to, and that’s likely because everything is made from scratch. Taqueria Doña Lupita: cheap, quick, friendly: tacos, quesadillas, and burritos from Q20 to Q30. Canela: bakery serving fresh sandwiches with sourdough bread or focaccia and very addictive cookies. Samsara: vegetarian restaurant with big servings and long hours. 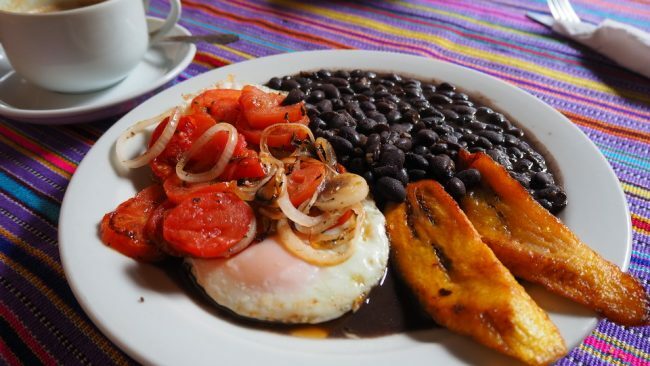 Fernando’s Kaffee: good coffee and breakfasts such as the Q20 desayuno típico. They also sell chocolate (and of course coffee). 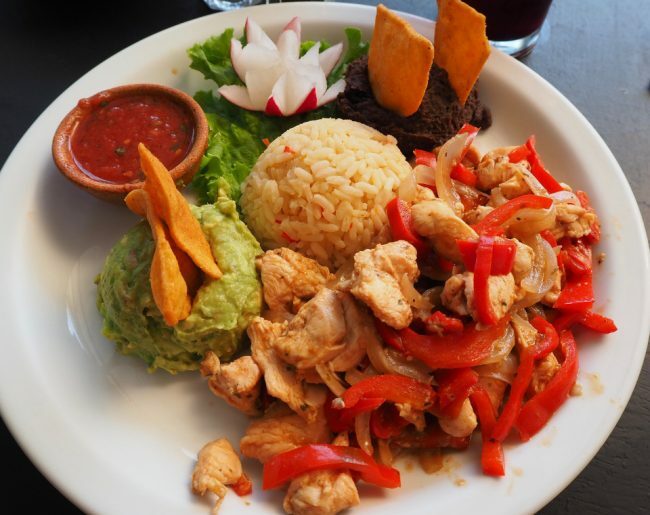 Casa de las Sopas: a large menu of soups and other traditional foods in an airy courtyard. Antigua Brewing Company: artisanal microbrewery with rooftop terrace and popular with travellers. Cafe Sky: hostel restaurant with a two-level terrace and large servings of tasty food, including a set lunch. There are a few important things I quickly discovered about Antigua. Coming from Mexico, I expected Guatemala to be cheaper, or at least on-par with its more developed neighbour, but I was shocked to discover that this isn’t the case. Antigua is also a little more expensive than Lake Atitlán, another highly touristed area I visited. I’m not sure why that is. Could it be because tourists in Guatemala congregate in only a handful of places, which had to upgrade their infrastructure and services to meet the needs of foreigners? This is all relative of course. Just make sure you don’t under-budget. Here are some average prices for Guatemala from Lonely Planet. While we’re on the topic of money, I never got my debit card to work in any ATM machines both in Antigua and in Panajachel. My debit card is on the Cirrus network and that seemed to be the problem, as a hostel employee once hinted. As soon as I used my Visa credit card in an ATM though, it worked like a charm. Although that meant having to take a cash advance (which I paid back into my account immediately). So make sure at least one of your cards (debit or credit) is on the Visa network. 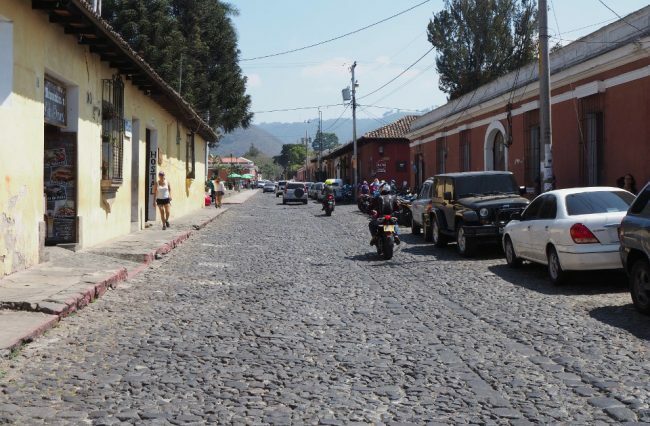 First of all, as you would expect in a colonial town, Antigua’s streets are covered in cobblestones. But these are unusually large, rough, and uneven cobblestones. And the sidewalks are cracked and wildly uneven too. I knew right away that I’d be wearing my hiking boots more often than not here, just to avoid twisting an ankle. Yes, I did see people wearing flip flops and even high heels, but that’s just asking for trouble in my opinion. (Or am I just becoming an old lady with weak ankles?) Consequently, I’d suggest you bring shoes with thick soles and preferably some kind of ankle support. Ripped off in convenient stores? I haven’t been able to prove this, but I have a strong inkling that I got overcharged when making purchases in convenient stores all over Antigua. Prices were not indicated anywhere, so I had to rely on whatever the clerk told me. Q12 for a litre of water? Q5 for a 20 g bag of chips? Those are more than twice the prices I paid in Panajachel! I suspect that they inflate the prices for tourists while locals pay a much lower price, but as I said, I haven’t really been able to prove that since I never went shopping with a local. You will get better prices in grocery stores (especially Dispensa Familiar, which offers indoor ATMs by the way) where the prices are indicated on the shelves. 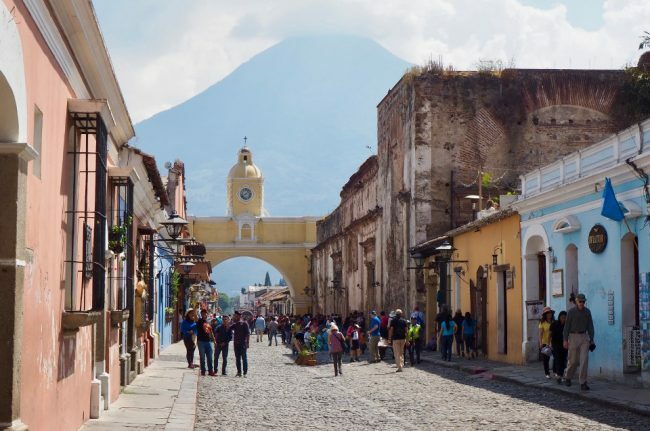 Hopefully these 10 things to do in Antigua Guatemala, restaurant recommendations, and practical tips will serve you well when you visit Guatemala’s prettiest colonial town. Before my father died at a very young age, his brother, my uncle, took him to visit Guatemala. So seeing these photos and enjoying all the country has to offer, creates a connection for me. I don’t believe I will ever get there myself, but I so appreciate the feel of this country. THANK YOU.